The latest Leadership-class supercomputer at the Oak Ridge Leadership Computing Facility (OLCF), Summit, hosts a mindboggling 200 petaflops of computational horsepower. With 27,468 NVIDIA Volta™ GPUs and 9,216 IBM POWER9™ CPUs, the system will perform powerful simulations, machine learning tasks, and scientific feats infeasible on almost any other cluster. At the Summit training workshop, I am learning from OLCF staff and Summit vendors IBM and NVIDIA about the capabilities of Summit and nuances of how to maximize performance on the system, currently ranked #1 on the TOP500. That means users of signac-flow will be able to immediately harness the power of Summit’s 4,608 nodes to execute workflows that operate on large signac data spaces. 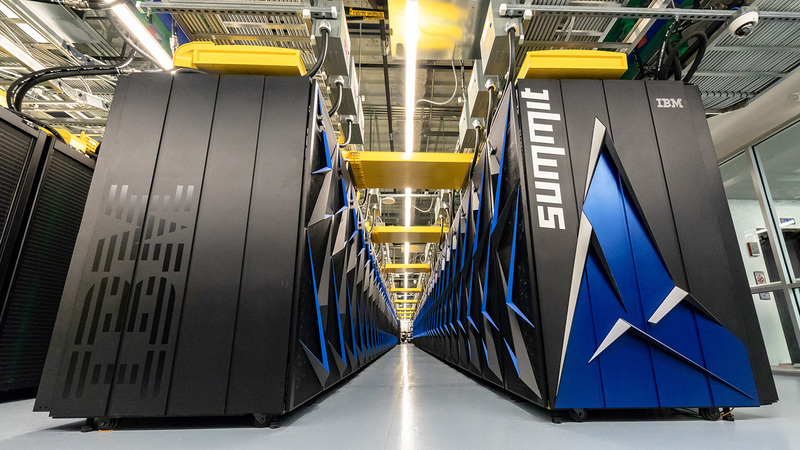 Summit is also among the world's most efficient supercomputers. Summit uses IBM’s Spectrum LSF (Load Sharing Facility) scheduler, and LSF is now supported along with SLURM and TORQUE schedulers. The LSF full-node scheduler and powerful jsrun utility make Summit a machine that can be tailored to highly unique resource requirements. Users are encouraged to take advantage of the jsrun visualizer provided by OLCF and signac-flow’s support for custom submission templates.